In line with their move towards a subscription-only application offering, Adobe has unveiled the new suite of apps it announced in May. Available immediately, Creative Cloud members can download the new applications via the Adobe Application Manager. This new generation goes under the moniker ‘CC’ for Creative Cloud, dropping the former CS (Creative Suite) naming convention. Going forward, anyone wishing to upgrade to the new versions of Photoshop CC, Illustrator CC, After Effects CC, InDesign CC, Dreamweaver CC, Premiere Pro CC and the other former Creative Suite applications will require a Creative Cloud subscription. 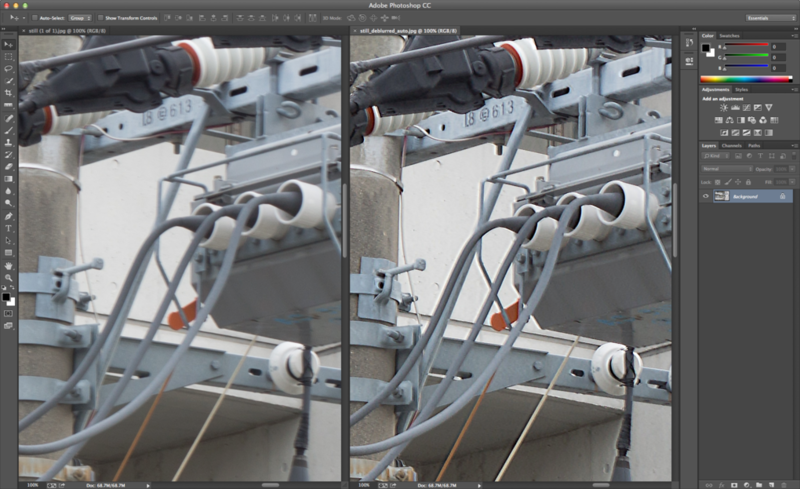 To get a feel for what the new software has to offer, The Verge did a hands on comparison between Photoshop CS6 and the new Photoshop CC. The major addition to PS CC from a photographer’s perspective is the addition of the Shake Reduction filter, reports The Verge. Shake Reduction works by assessing the blur pattern in an image and attempting to adjust accordingly, reducing blur and outputting a crisp and clear image. The resulting image above shows the Shake Reduction product (click for higher resolution image). I played with it myself and produced similar results: an image that looks a bit over-processed. It will be a useful tool when using less intense Shake Reduction settings paired with some touch-up to fix discoloration of the shifted areas. Smart Sharpen has gotten smarter in CC. The filter now accounts for the subject of the photo, and selectively sharpens it while leaving the background softer. Adobe has bolstered the resizing functionality in Photoshop CC as well. Historically, users have had to be satisfied with poorly resampled enlargements from Photoshop, or opt for expensive third-party plugins like Alien Skin Blow Up or Perfect Resize. Photoshop CC allows you to use a new intelligent upsampling algorithm to produce better enlarged images natively in the application, according to Adobe. 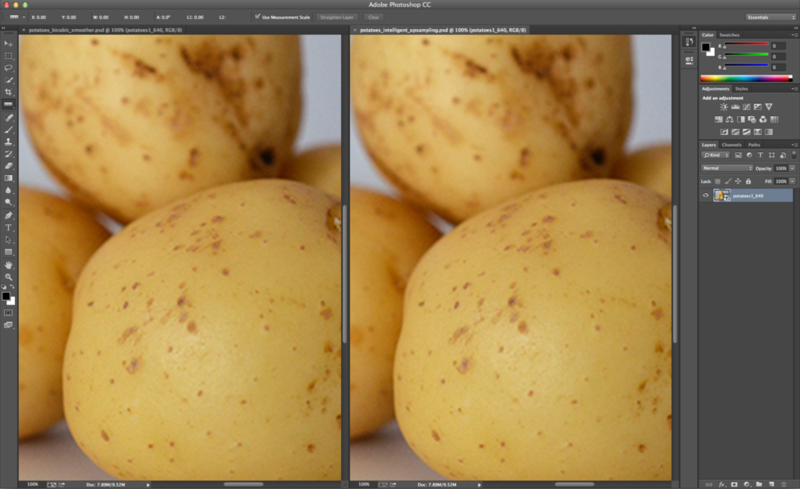 Pictured above is a 'bicubic smoother' enlargement on the left, and an 'intelligent resample' enlargement on the right. Again, I found that this feature sounded better on paper than in practice. The enlargement settings are sparse and I am able to produce much better results with Alien Skin Blow Up. Finally, Adobe added new editing features to Camera Raw 8, including radial filters, straightening of distorted photos, and a new healing brush. The new features in Photoshop CC will be useful, but is it worth the upgrade from CS6? If we were still on the same development cycle and one-time purchase software, I’d say absolutely not. But going forward, all new versions of Adobe Creative Cloud software are included with the subscription, so upgrading is a no-brainer once you are paying monthly. However, if you purchased CS6 outright, you won’t be missing much this time around. If you’ve had a chance to try out any of the new Creative Cloud applications, let us know what you think.